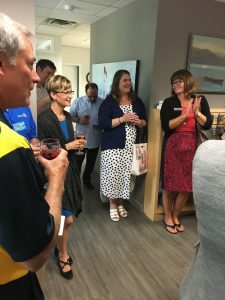 Thank you to Lakeside Hearing for hosting last night’s Business After Hours event! Everyone was so impressed with the wine and the appetizers catered by Creative Cuisine… delicious! Thank you Nichole Sorensen for the valuable takeaways on caring for your hearing, and the many services you provide at Lakeside Hearing. Thank you to Dragonfli Studios and the Creekside Theatre for donating the door prizes for the evening’s event. Four tickets to the theatre and a lovely bottle of wine was won last night by three lucky Chamber members. We hope you all had a wonderful time and enjoyed another excellent networking event!